Can we be brutally frank? The governors’ races are really tough to call this year. As of Wednesday afternoon, 11 contests had margins of three points or less in either HuffPost Pollster or RealClearPolitics’ polling averages (nine were inside that mark in both). Of those 11 races, 10 feature incumbents seeking reelection. We’ve mentioned before that this cycle has at least some small chance of threatening the modern mark for incumbent governor losses: In 1962, 11 of 26 gubernatorial incumbents met defeat at the ballot box. That said, the actual number of incumbent losses will likely be about half that or maybe even less. The most recent polling and reports from our confidential sources indicate that a number of incumbents’ positions have recovered or stabilized, necessitating ratings changes less than a week before the election. We also have shifts in some open races, and 10 new ratings in total. Among the many competitive races featuring incumbents, there are some important changes. Probably the most notable adjustment is in Colorado. Gov. John Hickenlooper (D) has narrowly led former Rep. Bob Beauprez (R) in most recent polling, and appears to be trending in the right direction just days out. Between Hickenlooper and Sen. Mark Udall (D), another vulnerable Centennial State Democrat, “Hick” looks likelier to survive. We’re shifting the Colorado gubernatorial race from Toss-up to Leans Democratic. Out west in Alaska, Gov. Sean Parnell (R) had fallen behind independent Bill Walker. But the incumbent’s numbers have recovered somewhat in the averages: While he still trails Walker in RealClearPolitics, Parnell has moved slightly ahead in HuffPost Pollster. This race is right on the knife’s edge (or perhaps the tip of a Kodiak’s claw?). Either way, the Alaska governor’s battle moves back from Leans Independent to Toss-up. We have two mildly unfavorable ratings changes for gubernatorial incumbents in New Hampshire and Oregon. In the Granite State, first-term Gov. Maggie Hassan (D) is seeking her second two-year term against businessman Walt Havenstein (R). (New Hampshire and Vermont are the only two states with two-year gubernatorial terms.) Hassan’s lead has narrowed consistently over the past two months, much like Sen. Jeanne Shaheen’s (D) now-slimmer edge in the Granite State’s Senate race. Hassan is still favored to win — New Hampshirites rarely throw out first-term governors seeking reelection — but the race shifts from Likely Democratic to Leans Democratic. In Oregon, Cylvia Hayes, the fianceé of Gov. John Kitzhaber (D), has caused the incumbent some problems in recent days. First, reports surfaced that Hayes may have taken advantage of her appropriated title as First Lady to help her consultancy business. Then news broke about how nearly two decades ago she took $5,000 to marry an Ethiopian to solve the foreigner’s residency problems. While Hayes’ actions don’t appear likely to threaten Kitzhaber’s position as the favorite, the last couple polls have shown him ahead by a narrower margin over state Rep. Dennis Richardson (R). Given these developments, we’re moving the Oregon contest from Safe Democratic to Likely Democratic. The Crystal Ball also has six new ratings in open seats. Undoubtedly, the most noteworthy is our change in Massachusetts, where we now see 2010 nominee Charlie Baker (R) as a narrow favorite against state Attorney General Martha Coakley (D). Despite its deep blue hue, Bay Staters have shown an affinity for electing Republicans to the state’s top executive office. Here’s an amazing statistic given today’s polarized politics: Over the past 50 years Republicans have occupied the governorship for a longer time in Massachusetts (26 years) than in ruby red Kansas (22 years). 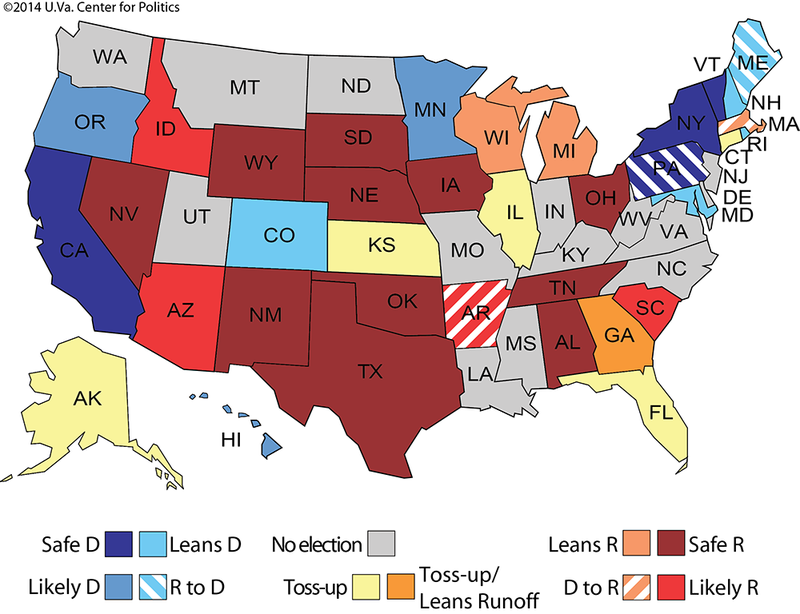 (By the way, we still view the Kansas race as a Toss-up.) Coakley’s own internal surveys show her losing by two points, and the polling averages both show slender Baker leads, with the Republican moving in the right direction. In light of this, the Massachusetts gubernatorial contest shifts from Toss-up to Leans Republican. Meanwhile, the race in Maryland appears to have tightened. While Lt. Gov. Anthony Brown (D) leads the polling averages by a fair margin, we have received numerous substantive reports regarding the Democrat’s apparent weakness as he attempts to succeed Gov. Martin O’Malley (D). Larry Hogan (R), a former member of ex-Gov. Bob Ehrlich’s (R) cabinet, is making things interesting in the solidly Democratic Old Line State, interesting enough that President Obama made a campaign appearance on behalf of Brown. Perhaps it wasn’t a good sign when some people left the speech early. While Brown remains the favorite — it is difficult to justify a belief that any Republican could win statewide here except under extraordinary circumstances — we are compelled to move the Maryland race from Likely Democratic to Leans Democratic. It is worth noting that the last two open-seat contests for governor in the state (1994 and 2002) were both decided by less than five points, with the Ehrlich win in the latter year representing the only time since 1966 (Spiro Agnew) that a Republican won the governorship. The race in the nation’s smallest state is proving to be more competitive than some might have anticipated: A Brown University poll found Rhode Island Treasurer Gina Raimondo (D) only ahead of Cranston Mayor Allan Fung (R) by one point. Other surveys have shown Raimondo ahead, but not comfortably, so we’re shifting the race from Likely Democratic to Leans Democratic. Republicans often win the governorship here. Two other open seats are now more certain to remain in Republican hands after Nov. 4. In Arizona there’s little indication that former state Board of Regents Chairman Fred DuVal (D) is closing the gap on state Treasurer Doug Ducey (R). Thus, the Arizona governor’s battle moves from Leans Republican to Likely Republican. In Nebraska, businessman and 2006 Senate nominee Pete Ricketts (R) is well ahead of Chuck Hassebrook (D), the former director of the Center for Rural Affairs. The Cornhusker State race moves off the board, going from Likely Republican to Safe Republican. The only good news for Democrats in an open-seat race can be found in Hawaii. Former Lt. Gov. Duke Aiona (R) might have been in a good position to defeat Gov. Neil Abercrombie (D), but then Abercrombie managed to score the worst gubernatorial incumbent primary loss in history, falling to state Sen. David Ige (D) in August. Although independent ex-Democrat Mufi Hannemann appeared to be a potential thorn in Ige’s side, the polls have the Democratic nominee comfortably ahead, and our sources confirm as much. The Aloha State contest moves from Leans Democratic to Likely Democratic. Another longstanding Crystal Ball rating has been to show the Maine race leaning to Rep. Mike Michaud (D) over incumbent Gov. Paul LePage (R), but this has been a very tenuous rating because of the presence of independent Eliot Cutler on the ballot, who could siphon off enough anti-LePage votes to tip the race to the incumbent. However, Michaud’s path got a little clearer when Cutler, a distant third in the race, told his supporters that they were essentially free to support another candidate. After that, Sen. Angus King, also an independent, switched his endorsement from Cutler to Michaud. As Cutler’s vote total goes down, Michaud probably benefits. So we’re reaffirming our rating in that race. One other gubernatorial note: On Wednesday, the respected Marquette Law School poll showed Gov. Scott Walker (R-WI) up 50%-43% on Democratic challenger Mary Burke. That’s a big margin compared to other polls, but we’ve had this race at least leaning to Walker the entire cycle — we’ve never called it a Toss-up — and barring some strange turn over the weekend, we expect Walker to pull it out. All told, these 10 ratings adjustments leave our national totals at 25 Republicans, 19 Democrats, and six Toss-ups. We will make final calls for all gubernatorial races on Monday, Nov. 3.